I offer birding and wildlife watching tours for visitors who are interested in hiking and watching exploring the tropical rainforest of Sorong city. These tours are suitable for tourists who want to take land tour before or after their diving/ snorkeling tour in Raja Ampat. The duration of the tour can be customized into 1 day for day trip to 3 or 4 days for camping and adventure in tropical rainforest. We have prepared basecamp in the forest. There are cooking and eating utensils too. We provide these things so that visitors do not need to carry heavy things to explore the rainforest. 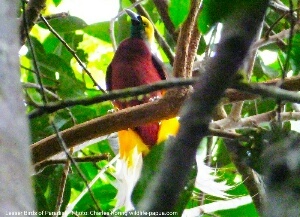 We will explore the forest to see butterflies, beetles, and a lot of other insects, birds, lizards, cuscus possum. 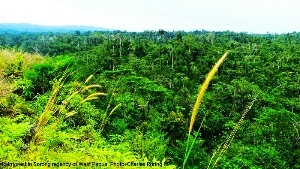 Tropical rainforest of West Papua is a rich environment. There are a lot of species of trees, shrub and creeping plants, as well as wild flower plants that can be seen in the forest. Visitors will be able to see the scenery of the forest while walking along the ridge of the savanna hills. As we walk deeper and then down the slopes of the hill, we will be able to reach a river whose bed is covered by big granite stones. Most tourists request day hiking tour. I highly suggest that visitors go in a group of at least 4 people or even more to share the cost. We can start in the morning and then return in the afternoon. Take an international flight from your country to Jakarta (the capital of Indonesia). After that, take a domestic flight, by Garuda or Batik Air or Sriwijaya, to Sorong city. I could meet you in Sorong and organise your trip to the forest. 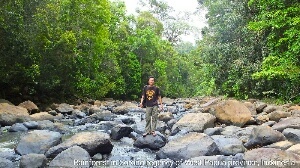 To book your rainforest wildlife watching tour, please, contact me (Charles Roring) by e-mail to: peace4wp@gmail.com or by whatsapp to: +6281332245180. This is the picture of Olive-backed Sunbird (Cinnyris jugularis) that I saw in a forest near Sorong city. For tens of years, this city has become the main gate to Raja Ampat islands for tourists who to spend their holiday scuba diving, swimming and snorkeling. However, there are also a lot of tourists who want to enjoy hiking, birdwatching and nature watching in general. As a tourist guide, I offer this tour. Because this forest is near the city, visitors can start the tour early in the morning and then return to their hotel before dark. From a short hiking and birdwatching trip, I saw Helmetted Friarbird, Olive-backed Sunbird, Coconut Lorikeet, and Yellow-faced Myna. I also saw some birds flying very fast in front of me making it difficult to identify them. I guess they were Black Lory, and Hooded Butcherbird. In addition to birds, visitors who take this tour will be able to see savanna hills, terrestrial Spathoglottis orchids, butterflies, grasshoppers, and unique tropical plants of Papua. We will walk along the ridge of Savanna Hills and then down to tropical rainforest of Sorong that is still in very good condition. The shortest trip is one day, but we can organize multiple day hiking, camping and birding tour that lasts for 3 to 4 days. There are several sites in the forest where we can use to build our basecamp. Because organizing a multiple day tour in the forest needs more logistical supplies, we will bring tents, mattrasses, cooking and eating utensils. To take this trip, please, wear sport/ hiking shoes with socks, long pants or short pants, apply insect repellent lotion, t-shirt and hat. During rainy season, bring raincoat. To enhance your birding experience, bring a pair of binoculars such as the Swarovski EL 8.5×42, spotting scope and tripod as well as birding camera such as Nikon P900 or Fujifilm HS50EXR. 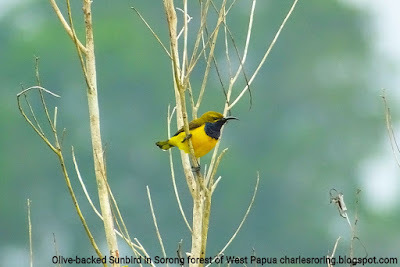 If you are interested in hiking and birding in Sorong forest, please, contact me (Charles Roring) by email to: peace4wp@gmail.com or by text message to ,y whatsapp: +6281332245180.